In his solo exhibition at Netwerk Aalst, artist Philip Metten (b. 1977, Genk) discloses both the past and the future of his work and practice. In the two halls of Netwerk’s exhibition space, the artist presents a project that will be realised in the near future as well as three projects that were completed quite recently. The central project of the exhibition is ESSEN, an interior design for a restaurant that will be executed in the coming months and will open its doors in 2017. With the design of ESSEN, as with previous projects, the artist has returned to the practice of drawing. Drawings always form the basis for Metten’s work. They provide the basis for sculptures, prints and reliefs, as well as for the larger architectural projects that he has recently completed, such as the much-acclaimed transformation of a cafe in Antwerp (BAR, 2013), the scenography for a group exhibition in Extra City Kunsthal, Antwerp (The Corner Show, 2015), and more recently the façade of the Kai Matsumyia gallery in New York (153. Stanton, 2015). For BAR, Metten extruded a diamond-shaped drawing horizontally to create a sculptural interior. The same drawing provided the basis for the scenography for The Corner Show. By this time opting for a vertical extrusion of the drawing, the artist created a vestibule and a series of sculptural wall elements that could be distributed across the Extra City exhibition space. For 153. Stanton, Metten adorned the gallery in New York with a sculptural façade by granting architectural dimensions to a circular drawing. ESSEN sees Metten returning to a drawing made in 2008, which he implements both sculpturally and architecturally while using the specific space of the prospective restaurant as his point of departure. ESSEN is situated in an L-shaped space, located on the recently renovated Vinçotte Square in the heart of the residential district of Borgerhout. For this work, in contrast with his previous projects, the artist doesn’t give the drawing volume, but instead folds the drawing twice to form an envelope, which he then inserts into the building’s shell, rotated by a quarter turn. The two drawings meet in the centre of the restaurant. The foundational drawing, similarly to the interior of the vestibule for The Corner Show, is translated into an aluminium skeleton filled in with parquet that runs from the floor and over the wall up to the ceiling. An erratic but unbroken line in the skeleton has been replaced by a roof light, running through the space like an artery. The line drawing serves not so much to grant a rational order as to disrupt the Cartesian logic of the gallery space, analogous to what Charles Jencks coined the ‘irrational grid’ in his book Late Modern Architecture. The artist’s bookcase and working table indeed abounds with books on architecture, and Japanese architecture in particular. The work of architects such as Kisho Kurokawa, Arata Isozaki, Hans Hollein and John Hejduk serve as a continuous source of inspiration. The exhibition at Netwerk Aalst will offer a unique opportunity to encounter the design for ESSEN in an early stage. 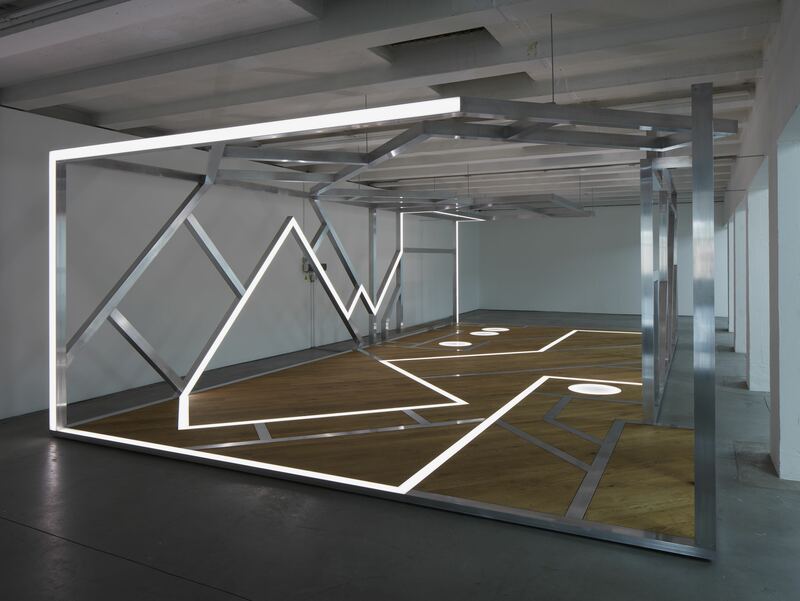 In the left hall of the exhibition space, the artist installed an uncompleted version of the interior envelope that he designed for ESSEN and that will be installed permanently in the front area of the restaurant once the exhibition is over. What we have is not a scale model or a true-to-scale maquette, but an actual building element of the future restaurant. Most imaginatively the artist plays with the conventions of architecture exhibitions. The part that visitors to Netwerk are able to enter is not a maquette for a project that may or may not be realised, nor is it a remnant of an abandonned building. This element will actually make up the entrance to the restaurant when it opens next year. The unfinished condition of this piece – only the skeleton, roof light and floor are present – underscores, above all, the artist’s play on the temporal logic of the scale model. The part of ESSEN on show at Netwerk looks something between a ruin and a science-fiction construction site. It reads as a piece of futuristic wreckage that has stranded within the walls of Netwerk. Cinema and film have been, unsurprisingly, a significant reference point and source of inspiration for Philip Metten; as a young artist he worked in a video rental store in Antwerp, which gave him the opportunity to view films on a daily basis. The striking fusion of past and pre-history in his personal visual language is undoubtedly owing to his penchant for B-movies and sci-fi, a genre in which the retro and the futuristic often go hand in hand. Both this part of ESSEN and the final form of the restaurant bare an unintentional resemblance to the architectural universes of films such as Fritz Lang’s Metropolis (1927), Jacques Tati’s Mon Oncle(1958), Ridley Scott’s Blade Runner (1982) and Christopher Nolan’s Inception (2010). The preview offered in the left hall of the exhibition space at Netwerk Aalst is balanced out by the artist with a retrospective section in the right hall. Three projects are presented, each of a different nature, programme and scale. Prior to the renovation of the restaurant (ESSEN), the artist transformed a cafe (BAR), designed the scenography for a group exhibition (The Corner Show), and redesigned the façade of an art gallery (153. Stanton) Spread out over eight tables, the artist shows, for the first time, the drawings that led to these architectural projects. In preparing for each design, the artist extensively reworked one of the many ‘mother drawings’ made previously. The rich palette of sketches and collages discloses how the artist patiently but intensely continues working at each of the respective drawings to reach the desired graphical configuration, spatial structure and material development. With the exhibition at Netwerk, Philip Metten takes stock of around three years of experimentation in the mercurial world of art and architecture. Over the course of the four presented projects, the artist refuses to take sides and intentionally suspends the disciplinary differences. He moves freely between the respective media and regimes of art and architecture, bringing together in his work sculpture, drawing, interior and building with kaleidoscopic intensity. The semantic regimes of art and architecture provide the frames of reference, but the results of his sculptural exploration of architecture, or the architectural exploration of sculpture, resist simple classification.